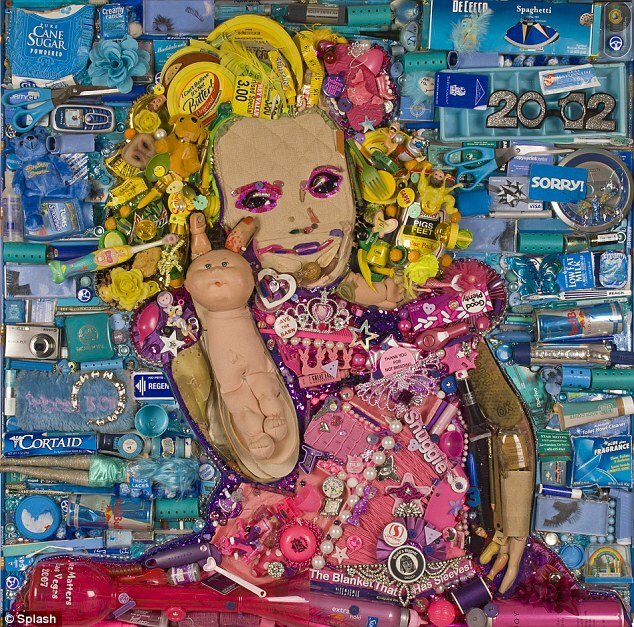 Artist Jason Mecier spent 50 hours and used 25 lbs of garbage to create a larger-than-life portrait of Honey Boo Boo. The San Francisco-based artist, who has previously made junk portraits of Donald Trump, Andy Warhol, and Phyllis Diller, used the seven-year-old superstar as inspiration for his latest project. Utilizing her trademark “sketti”, as well as butter, cheese balls, chicken nuggets and the infamous Go-Go Juice that kept her energetic while starring on Toddlers & Tiaras, Jason Mecier re-imagined her as a pile of garbage. Jason Mecier said: “I used Red Bulls, Mountain Dew, two cans of hair spray, three tiaras, make-up, mascara, fake eyelashes, coupons, a pink Snuggy box, and all sorts of things that make Honey Boo Boo so unique. “But don’t worry no roadkill was injured during the making of this portrait!” he joked, making reference to the Here Comes Honey Boo Boo family that often cook and eat roadkill animals found near their home in McIntyre, Georgia. Hardly any pieces in Jason Mecier’s sculpture are coincidental. For example, Honey Boo Boo, whose real name is Alana Thompson, recently got a pet chicken and named it Nugget. Honey Boo Boo was also recently immortalized in cartoon form, in a garish new comic book titled 15 Minutes. The colorful 23-page magazine charts Honey Boo Boo’s meteoric rise to fame over the past 11 months, from her TV debut in Toddlers and Tiara’s to landing her very own reality show.